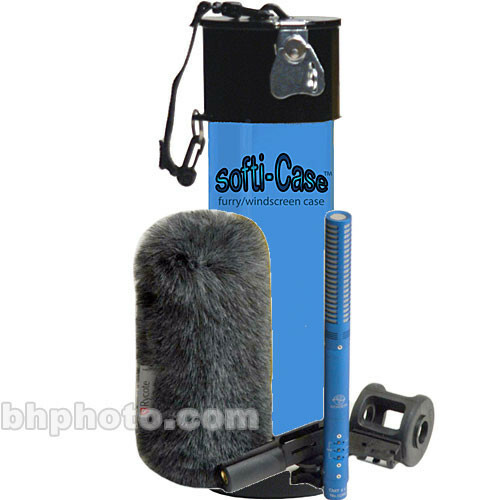 For Shotgun Mic & Softie up to 16"
The Alfa Case Softi-Case, Small (Blue) is a rigid vinyl case made to a shotgun mic, softie and shock mount up to 16" long. It has a lockable draw latch closure. Compatible with Shotgun mic, softie and shock mount up to 16"
Box Dimensions (LxWxH) 18.6 x 6.5 x 6.1"
Softi-Case, Small (Blue) is rated 4.0 out of 5 by 4. Rated 4 out of 5 by Jinkscat from Light and strong and affordable I use this to store and carry my Senn MKH416 with a softie attached and a shock mount, plus cables! This is a great case except it is almost perfect bar two things. 1-it is not waterproof, the seal at the top and the latch are not good enough, if dropped into the lake you would want to grab it fast! and the lock fastner is kinda dumb as you could break this case open with a screwdriver. Also the case is not wide enough to fit a standard Rode boom pole shock mount without unscrewin gthe base from the mount! actually just as they show in the picture, so I am not surprised there, but a little more width would have solved this. Rated 2 out of 5 by Jeff from Needs a redesign I bought my Softi-Case 2 1/2 years ago and though I love the idea the construction is not durable enough for pro use. Specifically the black plastic top section and lid are too soft and too easy to break. Alfa admitted this to me when they replaced the lid under warranty. Two years later they don't appear to have undated the design. The plastic attachment loop on the body just broke and I won't get it repaired. It's out of warranty and I feel like I would just be throwing good money away. I bought a case for ALL my audio gear with a slot for my shotgun and it turns out this is a better solution, especially for travel. Rated 5 out of 5 by Paul from Great protection for Schoeps and Sony If you need to cargo ship your Schoeps, Sony, or Sennheiser microphones, this hard tube is an excellent choice. there is ample cushioning inside to withstand vibration and drops. About the only thing I did not test is the claim for water proofing. Rated 5 out of 5 by Audiomaven from Re-designed lid closure This company re-designed the top lid and it is now very durable. I use this case to carry my Schoeps CMIT-5 in its Rycote Softie cover. No problems and it protects the mic and furry cover.